describes an com::sun::star::frame::Controller which can be used to browse and modify properties of components. The controller can be plugged into an com::sun::star::frame::XFrame, and will provide a visual component for inspecting and modifying component properties. Note that "property" here is a generic term - any aspect of a component can be considered a property, as long as some property handler is able to describe this aspect in a property-like way. The basic idea is that one facet of the inspected component is represented by a single line of controls: A label, an input control, and optionally one or two buttons which, when pressed, trigger additional user interaction (e.g. a more sophisticated dialog to enter a property value). Additionally, property lines can be grouped into different categories. A usual implementation of such categories would be tab pages, but other implementations are possible, too. Even more, the inspector can optionally display a help section at the bottom of its window, which can display arbitrary (context-sensitive) help texts. An ObjectInspector needs one or more property handlers which describe the facets of an inspected component - without such handlers, the inspector window will simply stay empty. 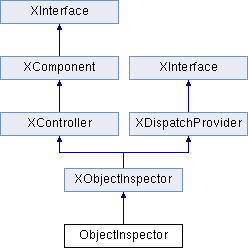 The property handlers, as well as more information about the layout of the inspector, are provided by a inspector model, which has to be implemented by the user of the inspector. Since property handlers might have the need to raise UI, they will be created with a context value named "DialogParentWindow", which contains an XWindow which should be used as parent of any windows to raise. If the com::sun::star::uno::XComponentContext in which the ObjectInspector was created already contains such a value, it is not overwritten. Only if it doesn't, the inspector will add an own value - which contains the inspector's main window - to the context when creating handlers. com::sun::star::lang::IllegalArgumentException if Model is NULL.